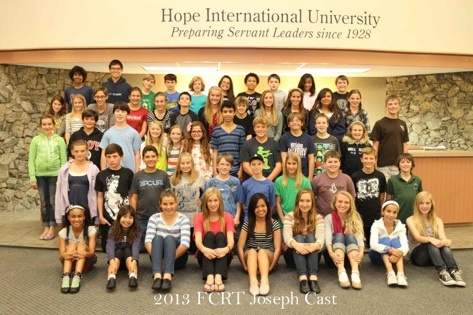 On Thursday, January 10th, 2013, at 7:30 p.m. the Fullerton Children’s Repertory Theater (FCRT) will premiere their production of the Tony Award-nominated show, Joseph and the Amazing Technicolor Dream Coat. All performances for the FCRT show will take place in the Pacific Auditorium at Hope International University. Based on the Biblical saga of Joseph and his coat of many colors, the musical parable follows the titular young man as he is sold into slavery by his older brothers, experiences a series of hardships and adventures, and eventually is recruited by the Pharaoh because of Joseph’s gift for interpreting dream. With music by Andrew Lloyd Webber that ranges from rock-n-roll and disco to country western and Calypso, Joseph and the Amazing Technicolor Dream Coat by FCRT will have performances through January 19th. Click here for a full show schedule and to purchase tickets.